White Rabbit! White Rabbit! White Rabbit! Welcome to the first day of March 2016. It is the month where we shall march with motility. It was sad to say farewell to February, the month of Positivity. Thank you February for giving us positive energy to make our dreams come true. Tranquillity is the mode for all meritocratic Goal Setters. Tranquillity sets the pace for the perfect environment to work, rest and play. Take away tranquillity and you shall invite hostility. With hostility you can never work, rest or play at your best. Let us march into March with tranquillity to keep away hostility. Nobility is the keystone to maintain a gentle and kind mood. Such a mood keeps you away from snapping, lashing out or being indecisive. Without nobility there is futility. Let us March in March with nobility to keep away futility. Motility is the power to do things spontaneously spurred by your positivity. It is the process of taking action. From Fascination we became aspired, then inspired and now motivated. Without motility there is fragility. Fragility is weakness. Fragility is illness. Fragility is delicateness. These are traits that we can do without. March in March with motility to keep away fragility. Capability is your passion and your desire in a particular field. Anyone can take up plumbing, carpentry, teaching, driving or any form of employment but if there is no passion and desire then there is no capability. Without capability there is vulnerability. You are exposed to redundancy. You are exposed to being sacked. You are liable for any mistakes. March in March with capability to keep away vulnerability. Stability is vital to a meritocratic Goal Setter. Stability is strength in whatever you do or think. It is your self-confidence needed to get you to the top. Without stability there is volatility. Volatility is instability. It is where things start falling apart. It is where your whole day becomes one of chaos. You become unreliable, unprofessional and unwanted. March in March with stability to keep away volatility. As usual do find time to visit my blog and read the complete articles. My blog can be found at www.inspirationalgalleries.blogspot.co.uk. I wish you a motivated journey in the 31 days of March. May you find your pot of gold in your own special way. White Rabbit! White Rabbit! White Rabbit! Welcome to the beginning of a new month and welcome to a new beginning for you. Like polarisation where the opposing schisms are on either side of each other like a magnet or an atom or a coin or a sudden temperament I want you to shift any signs of dreariness that you may have to an open field of absolute cheeriness. All things in life have an opposition. A magnet will oppose a like pole, two electrons will repel each other, governments will be challenged by the Opposition Party and as for us goodness will always be clouded with badness. Today I want you to polarise your possible dreariness that you may have and shift it to a more cheeriness feeling. Dreariness will always hold an aura of monotony, boredom and misery to your day and ultimately to your entire life. Cheeriness on the other hand changes this negative setback in your life. Cheeriness creates merriness, chirpiness, happiness and joyfulness. How can you possibly settle for anything less. To gain maximum exposure in your life you need to be immersed genuinely in cheeriness. People recognise this and take full cognisance of your presence and your value. You cannot become successful if you have hostility in your heart. Hostility leads to irresponsibility and volatility. Hanging on to anger, tempers, bad feelings and grudges makes you less cheerful. In fact it makes you dreary. 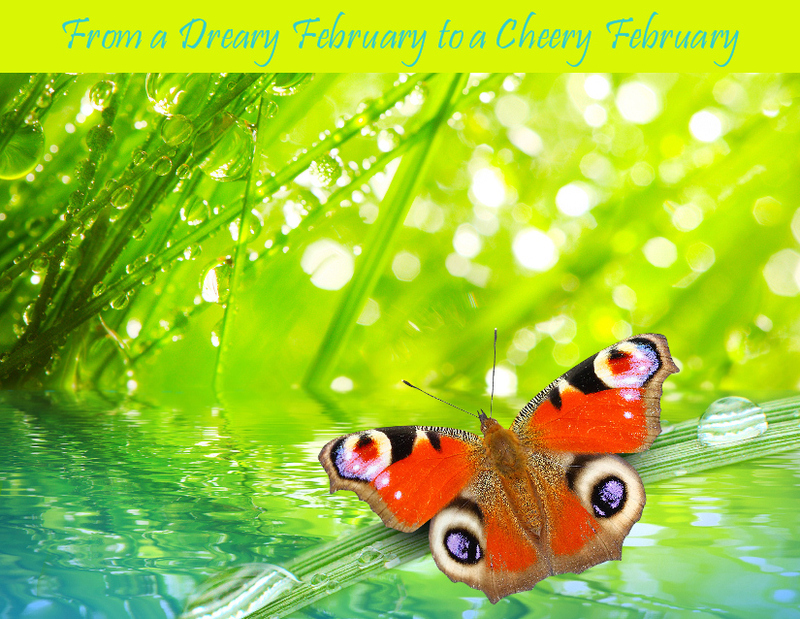 In February I want you to make you polarise your thoughts and shift them to a land of happiness and comfort. Landing on a cushion that is comfortable will always make you bounce back. Have you ever witnessed a butterfly emerging from its cocoon? This is the feeling you need to aim for. You need to be like the butterfly that flies away into the vastness of life and into the colour of the floral attractions. This is the spotlight of magnificence and a limelight of sheer brilliance that I want you to be drenched in as you embark on 28 days of glamourous work in February. You need to be excited about your life and about your work and about your dreams and your goals. You need to be cheery and not dreary. You need to have beauty and you need to be desirable. You need to create fascination and give back equal amounts of fascination. I shall guide you along a 28 day journey to achieve just that.